As part of the project NorTex Data Science Cluster, funded by the Research Council of Norway, scholars from UT Austin spent two weeks at IRIS. Hopefully the visit is the beginning of a strong collaboration across the pond. The two researchers, Adrian Ambrus and Roman Shor, are both associated with the drilling group (RAPID) at the University of Texas at Austin. In June they spent two weeks together with IRIS researchers, where they among other things, looked into research on latency in real-time drilling data. This collaboration will result in a paper presenting an overview on latency (the time delay from measurements to simulation and response). They are also considering laborating on certain sub-topics through additional papers. – The next step would be to bring in different perspectives from other industries outside petroleum, to see how they deal with delays, says Ambrus. Both researchers work with research and development related to drilling optimisation and automation. They emphasise the good synergies in the collaboration with IRIS. – Even though we are orientated towards US land wells and IRIS towards offshore industry in the North Sea, it’s interesting to be here, and we can learn a lot, they say. During these two weeks they also had a closer look at software developed at IRIS. – IRIS is world leading when it comes to modeling, says Shor. The visit was initiated through the NorTex Data Science Cluster, where one of the main objectives is to create stronger relations between researchers in Norway and Texas. – Knowledge sharing and closer collaboration on projects and publications is of mutual interest to the Norwegian and U.S. research institutions as well as the industry, says Jan Einar Gravdal, programme manager in DrillWell. UT Austin has a strong team of researchers, and several activities are very relevant to the SFI DrillWell and closely related to IRIS’ strategy on automated drilling. This work by Ambrus and Shor is managed by Professor Eric van Oort. – We are glad to cooperate with him and his researchers, and look forward to a productive collaboration, says Gravdal. The cluster is just getting started, but has already initiated several activities like workshops on Plugging & Abandonment and Intelligent Drilling & Well Technology at OTC in Houston in May, with more activities are planned. 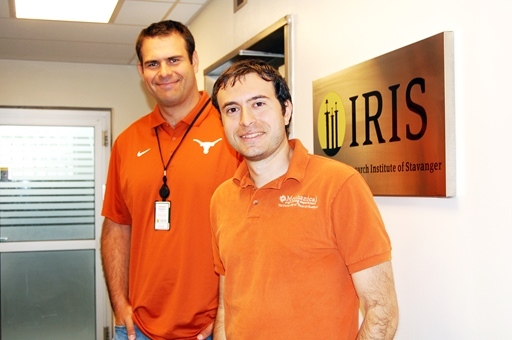 IRIS is managing the project where GCE NODE is a partner together with The University of Agder, Rice University and The University of Texas at Austin. The NorTex Data Science Cluster is funded by The Research Council of Norway through International Partnerships for Excellent Education and Research (INTPART).